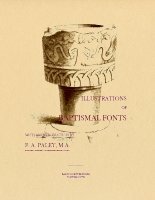 This book describes 124 baptismal fonts that can be found in our churches dating back to the “Early Norman” period and continuing to the “Perpendicular” period. Each font described is illustrated by an engraving. 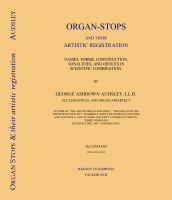 This book contains over 1,000 entries from “Abaculus” to “Zone”. 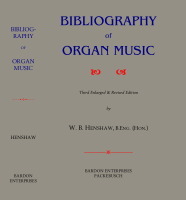 Contains an appendix containing a bibliography of further texts. 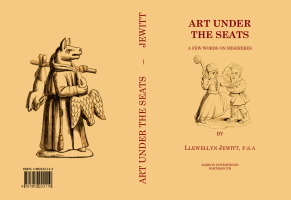 This book describes misericords (misereres), or the sculpture that is used to decorate the under-side of the seats which are in the choirs of our cathedrals and collegiate churches, art that normally gets overlooked. 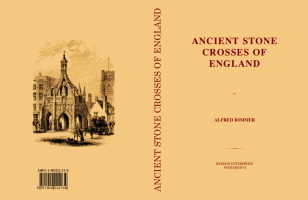 This book contains descriptions of Stone Crosses across the British Isles. Including, the market crosses at Chichester, Salisbury and Ross; Winchester “Butter Cross” ; crosses at Glastonbury, Iona, Abingdon, Leighton-Buzzard, Waltham, Bromboro, etc. 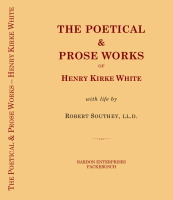 This book contains over 500 anecdotes of the above named eminent artists; these being derived from original communications, and sources otherwise not generally used. Each artist is divided into two sections: the first being a chronological account of his life; the second being characteristics, retrospective opinions, and personal traits. 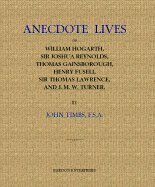 Thus giving a more flowing account of the lives of these men. 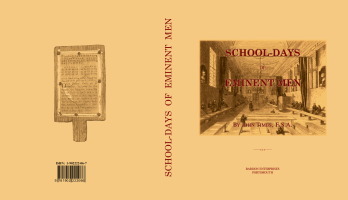 This book contains two sections: the first is an history of education from the reign of King Alfred to that of Queen Victoria, containing sketches on the education of Monarchs and scholars; the foundation of schools including Eton, Harrow, Rugby, Winchester, Westminster, Charterhouse, etc. The second is an account of the early lives of eminent people and how they acquired their learning. This book is a collection of photographs of the Commonwealth Electric Company’s Fisk Street power station in Chicago. They were originally a series of “magic-lantern” slides used in talks about electricity supply, generation and engineering. They are dated May 2, 1907. The individual headings are taken from a set of notes which accompanied the slides. 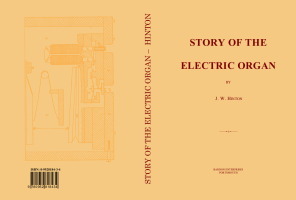 This book is a collection of photographs of the Edison Electric Illuminating Company’s L. Street power station and other sub-stations in Boston. They were originally a series of “magic-lantern” slides used in talks about electricity supply, generation and engineering. They were taken circa 1907. The individual headings are taken from a set of notes which accompanied the slides. This is a tale of life in Ireland in the early 19th century. It involves unscrupulous lawyers, duels and lost heirs. 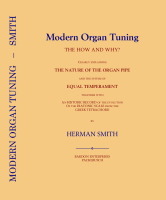 This book contains an explanation of the various technical terms used in music, as they occur in the works of the most eminent classical composers and theoretical writers, both ancient and modern; descriptions of the various voices and instruments, and of the names and qualities of the different organ stops, both English and Foreign. 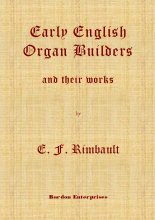 This book is about the Old English Organ Builders, from the fifteenth century until the Great Rebellion (English Civil War). 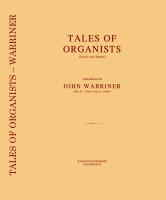 It is based on the text of a lecture given at the [Royal] College of Organists on November 15th, 1864. 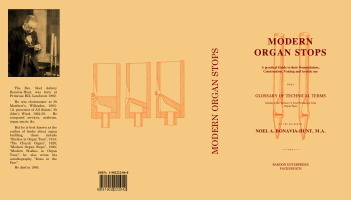 This book describes in a dictionary type format, various organ stops and other contrivances used on an organ; with details of combinations that each stop can be used with. 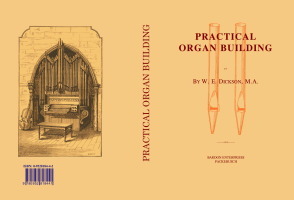 This book outlines in question and answer format ; the construction, history, and the playing of the organ ; it also describes the various organ stops, and contains a number of specifications of organs in Germany, England and France. 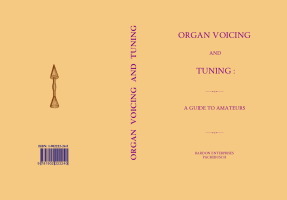 This book contains descriptions, construction details, and offers ideas for the use of the various stops or voices in an organ. 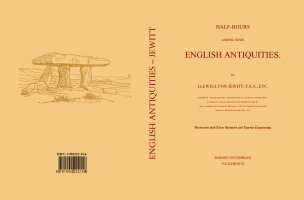 To supplement the volume, a completely new index of names and places has been added. 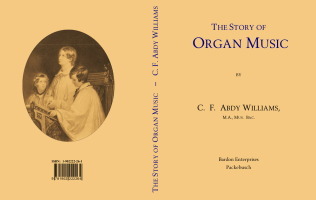 This book chronicles the history of music for the organ from its beginnings in Greek and Roman times through its development in mediæval times to the beginning of the 20th century. 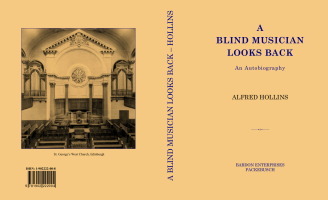 It contains biographical details of Italian, German, English, French, Dutch and Spanish composers together with some examples of their work. 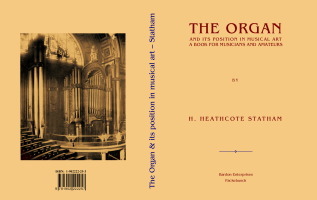 This book chronicles the development of the organ from its beginnings in Greek and Roman times, as an hydraulus, through its development in Germany, France and England, to the beginning of the 20th century. 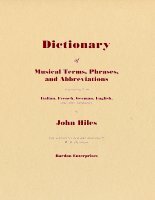 It includes the development of the keyboard, stops and bellows, and other inventions in the 18th and 19th centuries; how the instrument has had its opponents which caused its destruction in some areas. 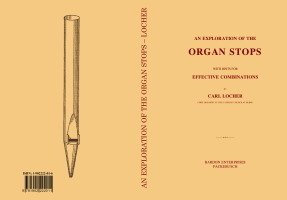 There are appendixes that list organ builders, organ stops and technical terms, a bibliography and a number of organ specifications. 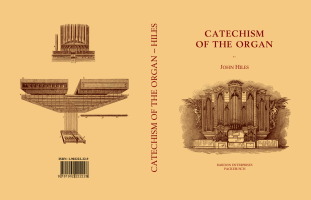 This book contains a History of the Organ by E. F. Rimbault, followed by a comprehensive treatise on the construction of the Organ by E. J. Hopkins; with an appendix of 342 specification of Organs, together with a list of foreign and English equivalent terms. 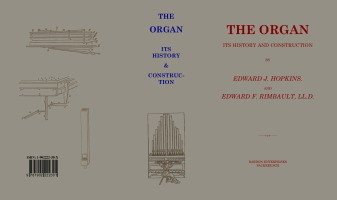 The main sections included in the history are: The Ancient Organ; the Mediæval Organ; the first Organ-builders; and the founders of modern Organ-building. 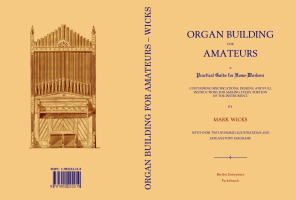 The main sections of the construction are: The exterior; the wind-collecting portion; the wind-distribution portion (sound-board, the table, &c); the mechanism; the sound-producing portions; tuning and temperament; common faults; and suggestions for the construction and erection. 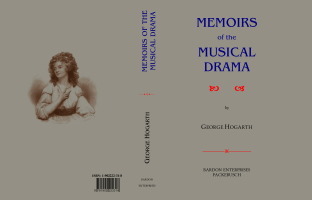 This book chronicles the history of Opera up until 1830s, starting at the origin of Opera in Masques, Moralities and Mysteries in the 15th century. It covers the art in France, England, Germany and Italy. 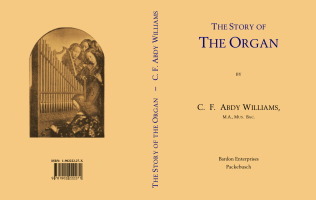 Composers, singers and authors included are :- Quinault, Fontenelle, La Fontaine, Lulli, Rameau, Ben Jonson, Alfonso Ferabosco, Nicolo Laniere, Milton, Matthew Lock, Dryden, Purcell, Scarlatti, Caldara, Lotti, Vivaldi, Mattheson, Keiser, Metastasio, Handel, Goldoni, Galuppi, Terradellas, Perez, Logroscino, Tesi, Faustina, Cuzzoni, Farinelli, Senesino, Caffarelli, Gizziello, Carestini, Guarducci, Durastanti, Guadagni, Mingotti, Gabrielli, Lavinia Fenton, Thomas Walker, Jeremiah Clarke, Thomas Augustine Arne, John Beard, Cecilia Young, Boyce, Michael Arne, Piccini, Sacchini, Anfossi, Traetta, Guglielmi, Sarti, Paesiello, Cimarosa, Zingarelli, Gluck, John Christian Bach, Naumann, Misliwiczek, Haydn, Mozart, Rameau, Rousseau, D'Hele, Dalayrac, Gossec, Salieri, Beau-marchais, Mehul, Cherubini, Catel, Berton, Le Sueur, Boieldieu, Hérold, Auber, Meyerbeer, and Halévy. This book combines two books published in 1806. The first section (book), contains an biographical account concentrating on his naval exploits, and also containing a copy of his will. The second section (book), contains accounts of the naval encounters which were published in the “London Gazette.” This is prefixed with “an address to the officers, seamen, and marines of His Majesty’s Fleets.” The accounts included are:- 1. Lord Howe - 1 June 1794. 2. Adm. Cornwallis - 17 June 1795. 3. Lord Bridport - 23 June 1795. 4. Sir John Jervis - 14 Feb. 1797. 5. Admiral Duncan - 11 Oct. 1797. 6. Sir Horatio Nelson, The Nile - 1 Aug. 1798. 7. Sir Sydney Smith - 1799. 8. Lord Nelson, Copenhagen - 2 April 1801. 9. Sir J. Saumarez – 9 July 1801. 10. Lord Nelson, Trafalgar - 21 Oct. 1805. 11. Lord Collingwood's, Continuation. 12. Sir R. J. Strachan - 3 Nov. 1805. 13. Sir J. T. Duckworth - 6 Feb. 1806. A letter from Lord Howe. 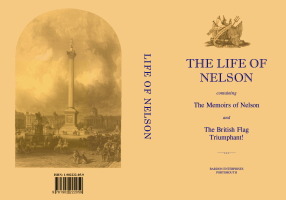 Account of public funeral of Lord Nelson. 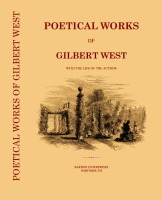 This book contains the poetical work of Gilbert West, comprising: On the Abuse of Travelling, in Imitation of Spenser; Education, in Imitation of Spenser; The Institution of the Order of the Garter; Elegy on a Blackbird; Father Francis’ Prayer; An Inscription on the Cell; An Inscription in the Cell; Inscription on a Summer-house. 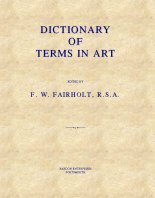 This book is the first collected edition containing essays which were originally published in the Art Journal between the years 1849-1852. 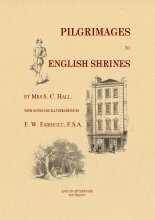 It describes visits to:- The Birth-Place of Thomas Chatterton; The Tomb of Thomas Gray; The House of Andrew Marvel; The Church of St. Andrew Undershaft, the Tomb of John Stow; The Tomb of John Kyrle; The Grave of Sir Richard Lovelace; The Grave of Lady Rachel Russell; The Monument of Wren; The Grave of William Penn; Shrines in Buckinghamshire; The Garden of Sir Thomas More; The Grave of Edmund Burke; A Day at Chatsworth; The Village of Eyam; The Grave of Grace Aguilar; Chertsey and its Neighbourhood. Which were undertaken by Mrs Hall and friends, at a time when many of the locations were beginning to disappear, and gives an insight into early Victorian pastimes.